John Adams Whipple (1822-1891) of Boston, Mass., stands out among pioneer photographers for his images of the moon and other astronomical subjects. His authoritative knowledge of the science of photograph-making was complimented by his artistry, as evidenced by surviving likenesses of Bostonians and other early Americans. 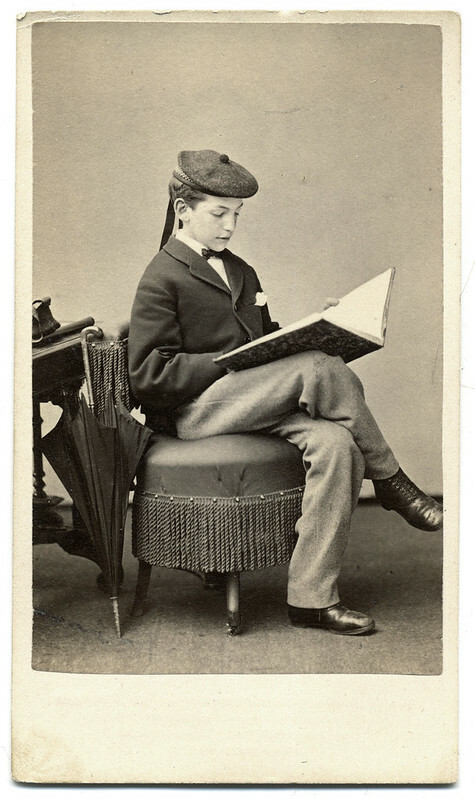 This Civil War period portrait of a studious boy is representative of his art. The young man gazes downward at a large volume, perhaps a ledger. The lines formed by his crossed legs, the umbrella leaning against the table, the tilt of his head and ribbon on the Glengarry-style Scottish cap form a triangle. The book provides a contrasting line that adds to the visual interest.